Face Factor is the ultimate in natural sun protection for your face. Now enriched with Hydresia for ultra-moisturizing. Face Factor is rich in antioxidant Green Tea and Licorice extracts to help fight damaging free radicals. Anti-aging peptides help reduce wrinkles and a remarkably effective Linoleic Acid helps decrease sensitivity to sunscreens, naturally. Natural Hyaluronic acid, Hydresia oleosomes, Aloe and Cucumber extract hydrate and soothe for beautiful skin every day. This fragrance free formula is water resistant and works great as a base under make-up. 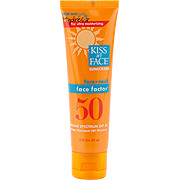 Sun Care Face Factor SPF 50 - 2 oz is shipped in a discrete, unmarked package. Orders are processed immediately and usually takes about 3 to 5 working days to be received. We do ask that you try it for 2 to 3 weeks to feel the full effects. Any information received is used only for order processing and shipping purposes. Your information, such as e-mail address, will never be disclosed to a third party.